How is lamp life determined? What is beam pattern of a lamp? Color temperature is a measurement of the color of the light. The measurement unit is in Kelvin degree. Color temperature changes during the day. For example, at Las Vegas on Shining day during summer at 9AM is around 6500 K, at 12 PM is around 8500 K, and at 5 PM is around 3500 K.
Home and restaurants mostly use 2700K to 3000K to create a warm and relaxing atmosphere. Retail stores or food-related application often select between 3000K to 4000K. 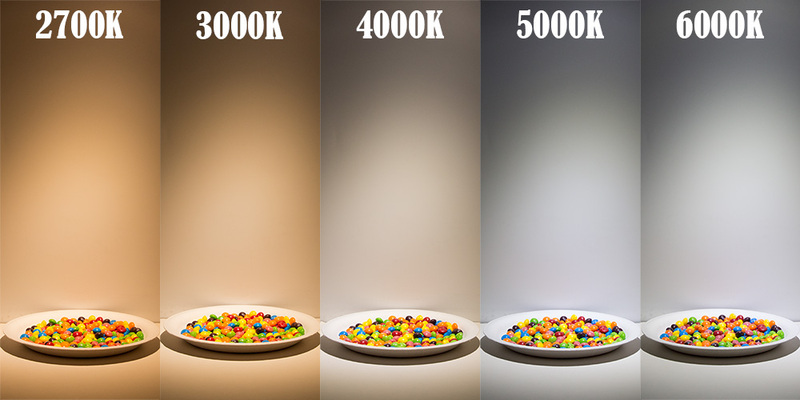 4000K to 5000K is recommended for the kitchen, office, or task area where need to have nice and bright light. 5000K is often found in supermarket, gallery, or area where need the colors to pop up. 6000K is for the commercial lighting or area where daylight white is needed.